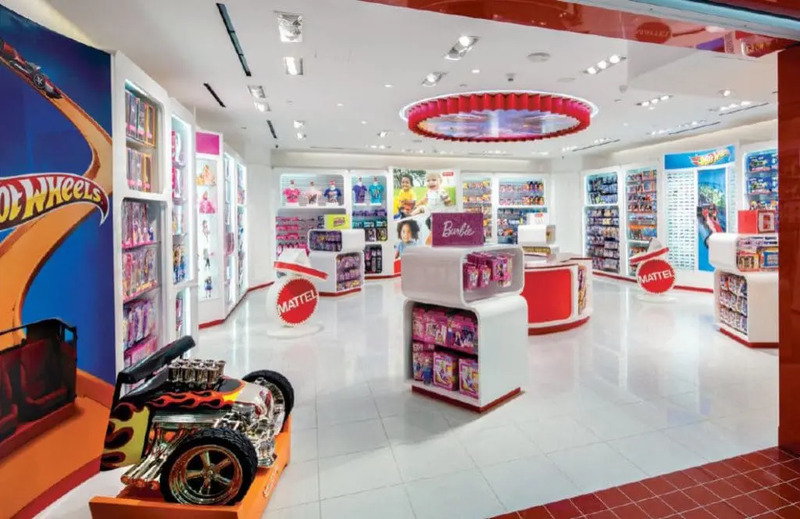 The design of this Mattel retail store experience, a one-of-a-kind storefront, came with a built-in challenge: its location in the Delta Terminal at Los Angeles World Airport. Customers have limited time to learn and purchase while making their flights or connections. Because the location is not a ‘destination,’ there is a sense of urgency and purpose. The Mattel retail store has the additional challenge of competing with the Internet, food concessions and other distractions for the traveler’s limited time. To meet this challenge, we created a fun and interactive environment that turns the wait time into “play time.” Every aspect of the 1,093 sq. ft. space encourages kids and adults to experience the breadth of the Mattel brands. The experience begins at the shiny red façade that attracts attention from a distance and frames the predominantly white interior. Older customers will recognize many of the toy icons sculpted on the façade that, along with “Play Made Here” in backlit letters, invites adult and child inside. Once there the entire space can be seen at a glance. The inspiration for the layout was the Mattel logo itself. Circular shapes and red color accents are subtly repeated throughout the space. A nine- foot light box on the ceiling playfully mimics the gear- shape of the Mattel logo and anchors the center of the store. The real logo is used sparingly, but playfully appearing only on the two PlayStations and as ‘lollypops’ on the bust forms. The round cash wrap and the curves in the four perimeter walls create a large circle and a concentric and engaging shopping path. Each of the three wall features a large graphic from a specific brand: Barbie and Hot Wheels to either side and Fisher-Price on the back wall. The store includes something for everyone, child or adult, and new memories are created through the joint shopping experience. Interactive PlayStations and displays placed throughout the space engage the consumer and encourage sales. Large marshmallow-shaped, building block inspired floor fixtures house merchandise in a kid-friendly fashion, their rounded tops and offset bottoms complementing the shapes and offset nature of the wall cubbies. Ample space is left between fixtures to allow customers with luggage and small children in tow to comfortably navigate the space. Also contributing to the shopablity of the store is the careful placement of merchandise. Lower cubbies allow children to touch the merchandise while products positioned on higher shelves showcases the brand from a distance. are intentionally offset to evoke a playful ‘discovery’ feeling about the product which creates a visual rhythm that encourages browsing. A small amount of negative space is introduced in between the fixtures to prevent sensory bombardment. This makes it easier to shop and more conducive for customers to accept product messaging. Keeping customers engaged inside the store are two displays that offer photo opportunities: Hot Wheels Bone Shaker & Barbie doll box display. The Bone Shaker attracts customers from its position at the front entrance and the Barbie doll box located on the backside of the storefront, is strategically placed at the exit to extend the shopping experience. The Barbie doll box allows children and adults to have a photo taken as if they were themselves a “doll” in a Barbie doll box.Both displays also provide sales associates an avenue to initiate dialog with shoppers. Adults and kids can also play branded games on two interactive PlayStations strategically balanced on either side of the store. The Fisher-Price area in the back of the store is dedicated to play and, with its small table and two stools at a height conducive for three-year-olds, allows children and parents to interact.